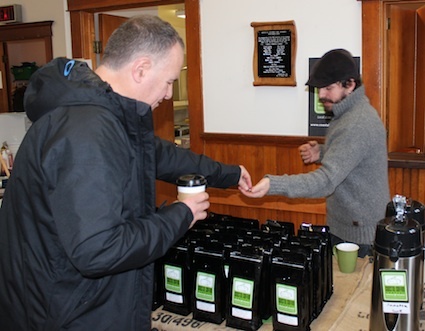 The smell of freshly ground coffee from Coastal Coffee Company assails every visitor at the Goderich Makers Market. GODERICH – A sure sign of spring? 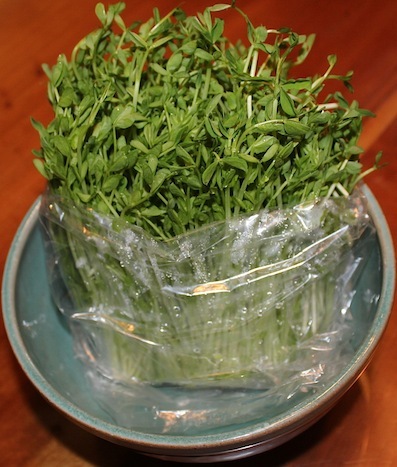 The first sighting at the Goderich Makers Market of tender green pea shoots with stems that grew long from trying to reach the winter’s sun. Shoppers gravitated to the patch of greens so neatly tucked between plastic containers of chicken broth and jars of beets and carrots, in a building full of vendors selling roasted coffee, honey, chocolate croissants, soft pretzels, soups, soaps and other homemade offerings. True, the pea shoots were grown in a greenhouse, taking advantage of the sunny winter days, but they were still prized for all that they promise in the months to come. 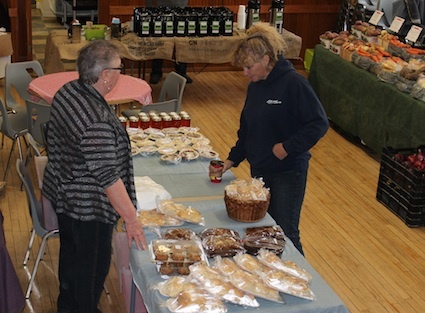 One wall of the market, held at Goderich’s MacKay Centre on the first Saturday of the month through the winter, was once again taken up with baskets of carrots, potatoes, turnips, beats, cooking onions and apples, much to the delight of shoppers. Folks commented on the vendor’s absence through the dead of winter. Out on the floor, neighbours stopped to compare winter holiday stories and chat about summer markets, planting techniques and all things sunny and warm. A quick door check of one shopper yielded a bag of potatoes and a bag of beets, pepperettes, two cartons of eggs and some chocolate dipped pretzels for the road. All that while balancing a cup of coffee from Coastal Coffee Company. The winter market is the brainchild of Amy Zoethout and Donna-Jean Forster-Gill of Feast for Good, who wanted to share their love of locally produced food and goods. The market continues through April and May, until the opening of the Goderich Farmers Market opens Saturday, May 16. Other communities throughout Huron County also host farmers markets through the summer months. For more information on these summer markets, visit online. Date: First Saturday of the month. April 4 & May 2. Things you should know: Best to bring cash rather than relying on debit or credit.